I had read this blog post by Shobha De sometime before my planned trip to Guwahati and Shillong. There is very little pink left in the Pink City, which now resembles an ugly, impersonal,concrete urbanscape, devoid of any character or charm. I had been anticipating before the journey that the memories of my childhood would be shattered beyond repair once I landed at Guwahati and then further pain awaited me at Shillong, where I was born and lived the first 10 years of my life. My ancestral paternal home was in Guwahati and most of immediate family (on both my father’s and mother’s side) lived in these two towns. My memories of Shillong are dotted with the beautiful meandering roads with pine trees on both sides, the blue city buses with their chimneys, walking to the Laitumkhrah market in the evening to collect the day’s newspaper (we got them in the evening those days, and i learnt much later that newspapers generally come in the morning) and groceries. There was this Khasi lady who sold fish at the market and always insisted my dad to let her adopt me, as she did not have any daughter to pass on the family fortunes. I also remember getting lost while playing at the parking lot of the Nazareth hospital and at the ripe age of 5, walked myself home down mainstreet. Every sunday, it was a ritual to visit the Lady Hydari park, ride the swings and the slides, feed some chickpeas to the monkeys and bamboo leaves to the deer or feed the fishes from the wooden bridge over Ward’s lake. There were some weeping willow trees in the park and daddy made me stand at a particular angle to take photographs. Every other week we also went to the State Library, where I used to choose from the rows and rows of Ladybird books in the children section. The year we decided to leave Shillong, we visted all these places and clicked pictures which are still in the family albums. While Shillong was the daily grind of school, home, rains during school hours, Guwahati used to be the most fun place of this Universe. And the center of this Universe was the beautiful wooden cottage proudly announcing itself to be the residence of Advocate K.P.Bhattacharjee (later this has been changed to simply “Bhattacharjees”). 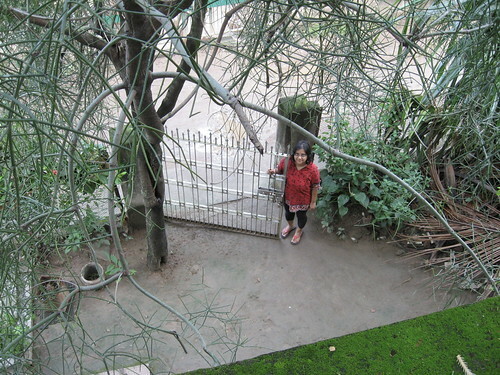 The wooden gate opened into a quaint little garden which led to the biggest rooms, smelling of the incense from the thakur-Ghar and tamul (raw betel/areca-nut, smells foul beyond belief). Inside there was a courtyard and a verandah, where everyone used to sit cross-legged on the floor for meals at lunch and dinner times. A wooden staircase led to the other building, which was also made of wood and used to shake during the thunderstorms. Next to the thakur-ghar was the room with a magic black box – the telephone… oh yeah! When I had no corner to explore or trees to climb or worms to poke or goodies to stuff myself with, I would hover around the telephone waiting (and hoping and praying and sometimes scowling) for it to ring. This house also saw a steady stream of visitors – some came for a few hours and some came to stay for days. It never felt like a house where anyone seemed to live a regular life. It was forever ‘festival time’. And the best part was the ride in the cycle-rickshaws, a loud announcement that we were now in the plains. We seemed to go everywhere on these massive cycle rickshaws. There were very few cars (Bijon-kaku had one and used to drive us to his house in it) and buses or any other vehicles. The only buses I seem to remember are the State transport buses that took us back to Shillong. The other important must visit place was the Shukreshwar Ghat, where I used to gape at the massive Brahmaputra river. I had last been to Shillong in 1998 and to Guwahati in 2002. Those were the trips where my memories got their first jolts. Shillong had changed drastically. The city buses were gone, taxis were swarming the city and suddenly there seemed to be a lot of people everywhere. There was an ugly building in the middle of the city center and roads were dirty. And horror of horrors, there were buildings all over the place. I could not believe that the hill I was staring at from across my old house was the very same one, where we used to often see small fires burning amongst the thick cover of trees. It used to be difficult to spot the two lonely houses on the hill, because they had green tin roofs. The numbers had nearly reversed. This time the roads seemed narrower. The buildings had grown bigger, uglier and spread in all directions. I visited my school, but no one seemed to be around and I dragged Sankarshan along on my pilgrimage from – old home – beat house – laitumkhrah police point – old school – Don Bosco square – the majestic ‘White’ Church (which btw has an ugly shade of grey-blue, but we still call it the White Church)-Nazareth hospital. Our plans to go visit the Lake and the Hydari Park were cancelled, perhaps to let my best memories still remain untarnished. Our house at Guwahati had to be pulled down due to massive damages to the structure and in place of the cottage there stands a concrete building. And same goes for the rest of the locality. The hills around the town used to be visible earlier, but these days one would only get to see rooftops. The “wide” lane that led on to the house seems no bigger than an alley. The roads around the city are choc-a-bloc with traffic, wierdly piled malls and buildings add to the disfigurement and the green cover seems to be reducing very fast. Like Shillong and Guwahati and Jaipur (and even Pune), perhaps there are more cities and towns in India which are shedding their identity and character to match up with the metro cities. Once inside an assembly line churned apartment home, one can hardly distinguish anymore which part of the country it stands in. And it does’nt seem likely to change anytime soon. However, nothing can beat a homecoming. A generation has moved ahead and these days instead of songs emanating unexpectedly in my older Uncle’s voice, the tinkle of my young niece’s phone can be heard. But there still is the hulla-balloo of the “Bhattacharjee” residence. The food still tasted the same and my aunt continues to make sure everyone is well fed, goodies of every shape and flavour could be “accidentally” found in various jars around the kitchen, the visitors still trooped in at every hour, endless cups of tea floated in and out of the kitchen, more books and shelves have been added, heated arguments about politics, literature, movies, etc shatter the silence and the ‘festival still continues’. This entry was posted in Uncategorized and tagged me on October 24, 2009 by runa. I thought you were going to switch over to WordPress ! What’s the plan for that ?